United Airlines passengers were in for a chilly surprise the other day. En route from Newark to Hong Kong, one of the airline’s B777s had to divert. Following a medical emergency, the aircraft turned around to divert. It went on to land in Goose Bay. What should have been a simple stop to offload an unwell passenger, however, turned into a rather long stay in Goose Bay. The scenes were reminiscent of an Air France B777-300 which got stranded in Siberia for three days in November last year. 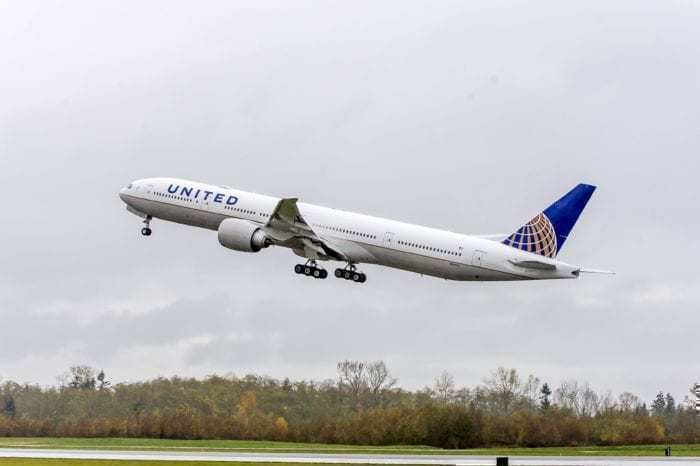 On Saturday a United Airlines B777 departed Newark Airport at 2003, two minutes ahead of its scheduled departure time. Around 45 minutes into the flight a passenger started to have seizures. The crew made a request for any medically trained staff on board to make themselves known. A decision was then made to continue the flight. Following this, the passenger’s condition started to deteriorate, and as such, the aircraft turned around to make an unscheduled landing. The aircraft went on to land, whereupon the unwell passenger was taken to the hospital. The door which was used to offload the unwell passenger became jammed open in the cold weather. According to local weather reports, the temperature was as cold as -45 degrees Celsius including wind chill. As the aircraft was unsuitable to fly, the passengers had to wait in goose bay for a replacement aircraft, however, there was another problem. No Canadian border control staff were on hand at the airport at the time of the incident. As such, the passengers had to remain on the aircraft. United Airlines told us that they had food delivered to the aircraft for the passengers. Once border control arrived, the passengers were transferred to the replacement aircraft and returned to Newark with their luggage. The airline went on to add that the passengers arrived back in Newark 22 hours after they left. Upon arrival at Newark, they were greeted with “compensation, reimbursement, hotel accommodations, rebooking options, and meals” from senior members of United staff. Were you on the stranded B777? Let us know down in the comments below! couldn’t they have diverted to KEF in iceland? or any major airport? that u-turn looks like it took several hours to accomplish! 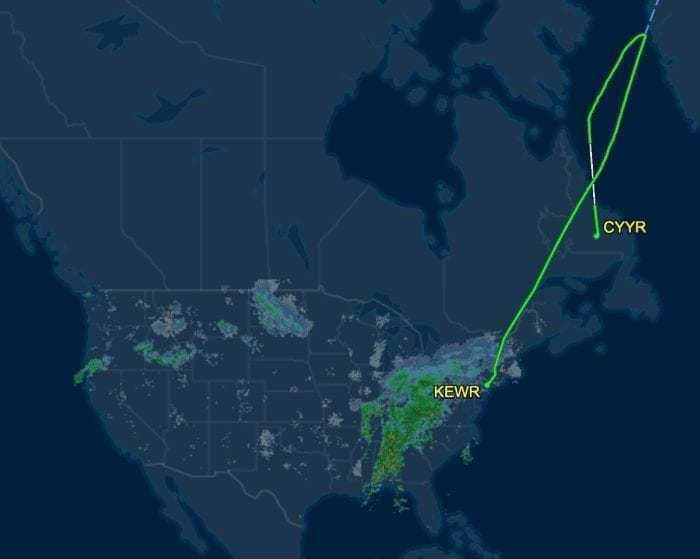 seriously ridiculous trajectory pilot need to think more about diversions not just knee-jerk to the reactions of flight attendants and land in a blizzard. guy’s on board 2 hours what’s another 30 mins to land at a proper airport? Here’s a similar story for you all. So, it was 2008, I was flying United from Newark to Beijing. I had dozed off after dinner, and when I work up I looked at the moving map display and it sure seemed like we were headed south along the west coast of Greenland. As I wrapped my head around that reality, the captain comes on the PA and announces that we have a medical emergency and we had turned back towards Goose Bay as it was the nearest suitable facility ( over 2 hours away!) So back we head to Goose Bay, and about 30 minutes out the captain announces that the medical emergency has resolved itself so no Goose Bay for us. But, we are out of Gas and he is out of Flight time so the company has directed us back to Newark where we will bed down and take a do over tomorrow. So, 12 hours total in the air, but we arrive back right where we started! As we approached Newark, rumour spread that the “medical emergency” was apparently a fake! There was an older Chinese woman aboard who was being deported. She apparently decided to play her last card and fake a heart attack hoping that would allow her to stay in the USA. OK, so now everyone is pissed, we get off the plane, get to a seedy hotel in Newark around 3 AM, need to be back at the airport by 10 AM and are all generally disgruntled. So the next day we get on the plane and last minute who boards (accompanied by a couple of not happy U.S. Marshalls this time) but Mrs. Fake Heart Attack!!! The looks she got from the rest of us should have turned her to dust but somehow they didn’t! She was VERY well behaved on the now packed to capacity flight to Beijing! The worst part about the whole experience? I didn’t get any miles for the first attempt! My pleasure Tom. Everytime I hear about “Goose Bay” I shudder at the memory of the experience! John you should have got miles that is super unfair!